OTTO Rewards is our way of saying thank you for being a loyal OTTO guest. 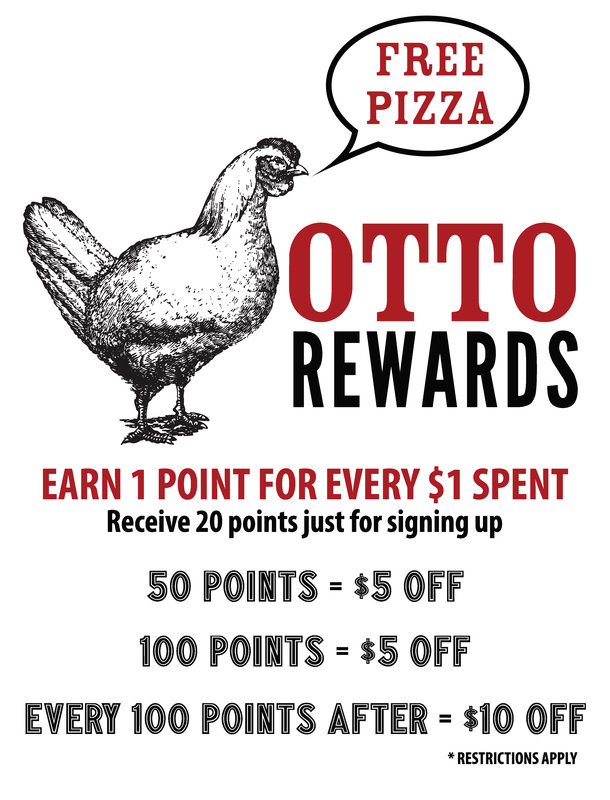 Once you are signed up, you will receive a point for every dollar you spend at OTTO. Earn $5 at 50 and 100 points, then $10 off each 100 points thereafter. Earn 20 points just for signing up! On Sundays and Mondays, earn double Rewards points on every purchase! Exclusive Offers: OTTO Rewards members will be eligible for exclusive offers and opportunities! Additional Rewards Opportunities: In the coming months, OTTO Rewards members will have opportunities to earn additional Rewards opportunities, including OTTO swag, exclusive experiences, and special events!